Users of BusyFingers v4 or earlier should contact Grape County for information on how they can upgrade to this latest version. Download the trial version today! Upgrade your v4 site licence for just £50. Upgrade your v3 site licence for just £120. Upgrade your v1 or v2 site licence for just £175. Find out what's New in this release. 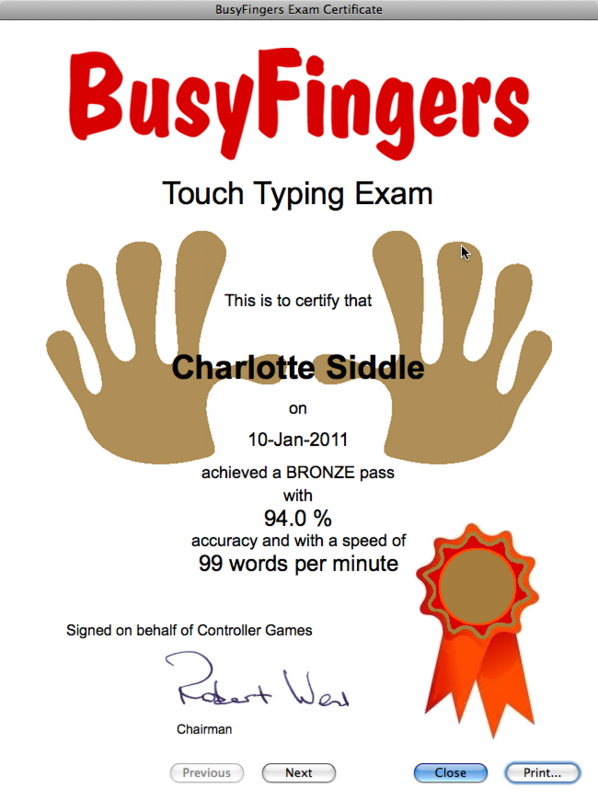 BusyFingers has been designed specifically for young children but it can still be used by adults. The novel user interface really does appeal to children and once they've started, they want to keep on practising. The novel user interface makes children want to learn and is designed so that even the youngest child can use it unsupervised. All the characters that are used during a lesson are displayed clearly on or next to the finger that is used when typing, keeping the interface clear and easy to use. 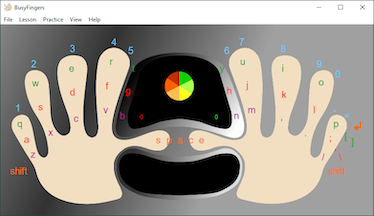 The character to be typed is highlighted so the user can see which finger to use. When a capital letter or special character is to be typed, the appropriate shift key is also highlighted. The words used in the lessons are split into those suitable for Key Stage 1 & 2 and for Key Stage 3. The words used in the Key Stage 1 & 2 lessons are based on those specified in the National Literacy Strategy. BusyFingers is suitable for users of all abilities, including those with visual impairment, because BusyFingers has five screen sizes and a choice of font and font size. The login dialog for BusyFingers can now be configured to allow users to add themselves to the database or to only select their name from the list of names presented by the dialog. This latter login dialog therefore prevents user from adding any name that they wish. The login dialog can also be configured to require a password before the user can access their lesson and this ensures that only the user has access to their account and prevents others users accidentally (or otherwise) using a different users account. Introducing children to a computer keyboard can be difficult. BusyFingers helps to make this easier by displaying a picture and getting the user to type the words associated with that picture. This combination of image and words, helps the user to learn to associate words with objects and how to spell those words at the same time as introducing them to the keyboard. The images and the words associated with the images used by BusyFingers are completely customisable by the administrator. BusyFingers can also provide visual and audio feedback throughout the lesson and statistics can be displayed at the end of each lesson to help the user identify their strengths and weaknesses. The green bars show the average speed; i.e. how quickly or slowly, each character was typed. This allows the user or supervisor to identify any characters that the user is having difficulty in reaching. The red bars show which characters were pressed incorrectly and again helps to identify any potential difficulties. When the same lesson has been completed at least twice, a line graph is displayed showing the users progress; i.e. their word per minute rate (solid green line) and their error rate (solid red line). If the user has to achieve a certain criteria before they can progress to the next lesson, the line graph will also show the criteria that they have to achieve as a dotted green or red line. 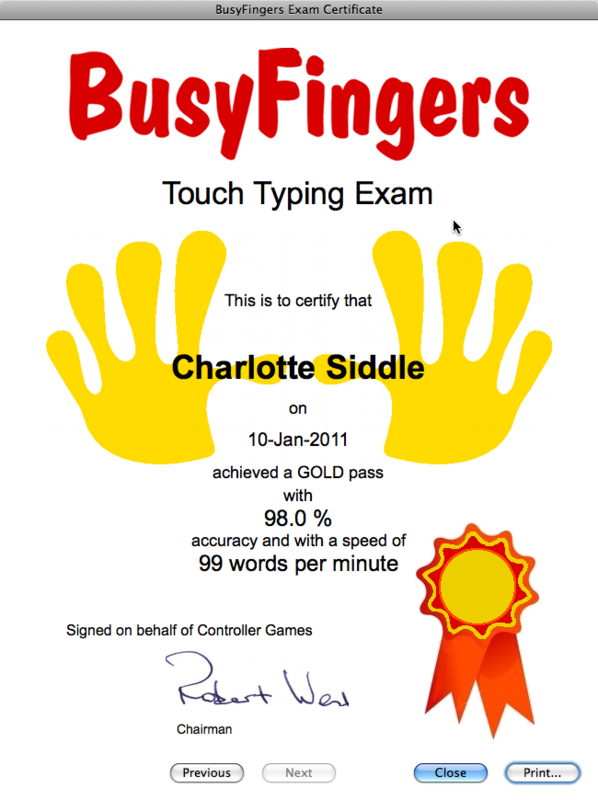 BusyFingers now includes an exam that users can take at anytime. When the user passes the exam they are presented with a gold, silver or bronze certificate, dependent on the grade that they achieved. To obtain a bronze pass, a user must have an accuracy of at least 90% and a speed of 20 words per minute or better. The reason for such an apparently high level of accuracy is because even when a typist is 90% accurate, they will type one wrong character in 10, which equates to a spelling mistake approximately every second word! Even with an accuracy of 99%, which by anyone's standard is excellent, the typist will be making one mistake every 100 characters, which is about one spelling mistake every sentence, which is not really very good! That is why, in the exam, as throughout all of BusyFingers, accuracy has a greater bias than speed. 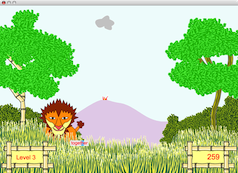 The user can practice the characters they have learnt in the lessons at any time, using the Jungle game. The game is challenging but ease to use and only uses words from the lessons that the user has completed. During the game the words to be typed appear on the screen, along with some animals and the user has to type the words to stop the volcano from erupting. The faster the words are typed the more points that the user scores. BusyFingers now allows a user to configure how they want the application to look when they use it and to set the criteria that must be achieved before being allowed to progress to the next lesson. These settings are saved to the database and are retrieved each time the user opens the BusyFingers application. In the settings dialog the user can select the size of the application's window, the size of the font used by the application, whether to play the audio associated with certain actions and dialogs, which database to use to select the lessons from and many others options. Note, that all of these settings are only available if the administrator has set the appropriate permission level for the user in the user's preferences in the Teacher application. BusyFingers comes complete with an administration utility called Teacher (password protected) that allows the administrator to manage groups of users, what settings those groups and users have, export the user's data to a text file for advanced data analysis (in a different program) and complete control over the words used in the lessons allowing lessons to be crafted to the specific needs of individual children. The administrator also has control over which characters are used in which lessons allowing them to craft completely the lessons that are taught within the BusyFingers application. The Teacher application also allows groups and users to be imported to the database from a text file, making it easy to configure the software each year for a new group of children. The Teacher application also shows, in numerical and graphical form, the statistics for each user so that a administrator can, at any time, evaluate the progress of any of the users. In addition, the graphs that are displayed can be printed allowing the administrator or user to include a graphical summary of the users progress for each lesson. The site licence version of BusyFingers can be configured to be used on a network making it easier for the administrator to manage the databases and keep up to date on the progress of the users. BusyFingers can also be used on a single computer. In either configuration, there is no limit to the number of groups or users that can be entered in the database. If you would like to try BusyFingers, download the trial version of the software. 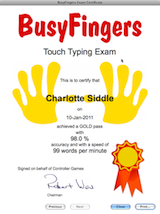 BusyFingers now allows users to take an exam to prove how good their touch typing really is. Users who pass the exam are awarded a certificate that they can print out and frame. It is now possible to display pictures within BusyFingers to help younger users become familiar with the keyboard by associating images and words. The criteria that must be achieved before progressing to the next lesson can now be set on a lesson by lesson basis; previously all the lessons used the same criteria. The statistics shown at the end of a lesson show the criteria (as a dotted line) that a user must achieve before they can progress to the next lesson. BusyFingers now offers the choice of two font styles giving the ability to display certain characters, for instance the "a" character, as children recognise it; i.e. as "a". When modifying the phrases used in the lessons that teach the QWERTY keyboard, the character set for each of the lessons can now be specified. It is also possible to check that the phrases in the lessons conform to the character set for the lesson. BusyFingers now has 5 window sizes to accommodate modern computers with large screen resolutions. The Speed Test practice area has a greater selection of phrases. There is now a user setting to control whether the text that the user types is displayed or hidden. The menu structure has been modified slightly with the introduction of a Practice menu option. There has been a change to the way that the words per minute calculation is made to make it more accurate. The exam certificates, for those users that have passed the exam, can be viewed and printed from within the Teacher application. When the Users database has a large number of users, the Teacher application is now much more responsive when viewing the statistics or manipulating the users in the groups. Added an "Apply to all Users / Groups" check box in the Preferences dialog in the Teacher application. This allows settings made to a group or to the default group settings to be applied all the users in the group or to all the groups in the database. This means that administrators no longer need to go through each user's account individually to apply the same change to all the users. BusyFingers now remembers correctly, when a returning user has completed a lesson and advances them to the next lesson. 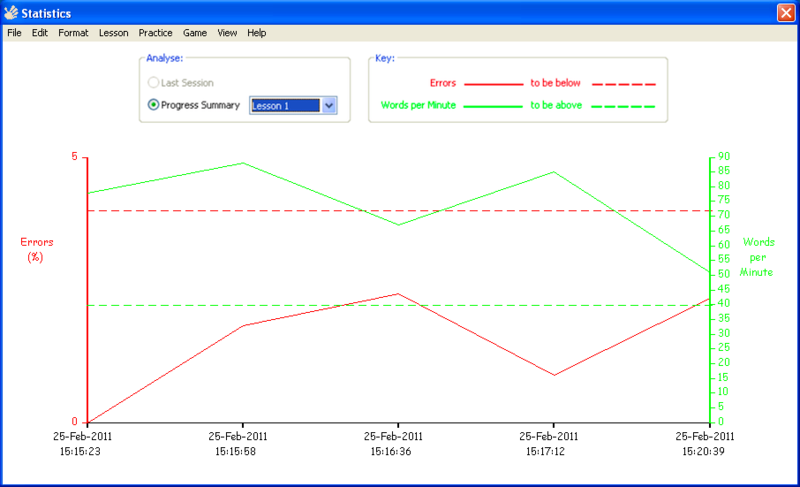 In the Statistic window, within BusyFingers, the progress drop down menu now shows the current lesson. The Teacher application now allows any character to be used in a lesson. This is to allow the phrases database to be customised to use foreign words that use accents. On completing the Speed Test, the BusyFingers window now reverts to the correct size. Fixed the issue where if users viewed the Statistics window during a lesson they were not then able to go back and complete the lesson. Fixed a problem with the Jungle game where the same word was displayed a number of times in a row. Users can no longer start a Speed Test lesson while they are in the middle of a normal lesson as this led to the application crashing. The popular "Letter Invader" game has been re-introduced back into BusyFingers. This practice area drops a letter from the top of the screen and points are scored by typing the letter before it reaches the bottom. The higher up the screen the letter is typed, the more points that are scored. The more letters that are typed, the faster the letters fall. The Jungle game has been upgraded to include levels. The more words that a user types correctly the higher the level. Of course, the higher the level, the harder it becomes! That volcano is going to erupt!! In the Teacher application, it is now possible to export the data that is being displayed for the selected group or user. When using a single quote mark in users names or in the phrases used in the lessons, the single quote mark is now handled correctly and no longer produces an error. BusyFingers has been built to be compatible with Intel Macintosh computers, Mac OS X v10.4 & v10.5 and Microsoft Vista. Users can now be organised into groups, for instance, by class, making it simple to organise hundreds of users. 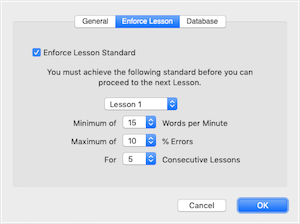 There is now an option to enforce that the user must achieve a certain standard in their current lesson before they progress to the next lesson. The standard that needs to be reached can be set differently for each user and for each lesson. Importing the users names and groups from a text file makes adding a large number of users to database very simple. The Teacher application contains a number of tools for the creation, editing and removal of the groups to which users belong. There is also complete control over the default settings that a new group will have when it is created making it simple to create a number of groups with the same custom settings. The same tool makes it easy to later modify those settings for any of the groups created. The settings available for groups are also available for each user so it is possible to modify the settings for users on a user by user basis. The database holding the words used in the lessons is now distinct from the database holding the users and their data making it easier to create custom phrases databases that can then be applied on a user by user basis. When a user starts a new lesson, for the first few repeats of that lesson, they are forced to practice the new characters that are being taught in that lesson. Each time the user returns to BusyFingers, they are now asked if they wish to automatically continue with the highest lesson they have completed. There is now an option to only allow users to select their name by clicking on it. This prevents the users adding whatever name they wish! There is now an option to require each user to enter a password before they can start using BusyFingers. The format of the databases used with BusyFingers has been changed resulting in faster response times. Export to a text file all the users names and their data for each of the lessons they have completed makes it possible to analyse the data with a different data analysis application. The single computer licence version of BusyFingers now has an absolute requirement for the users database to be in the folder Data in the same folder as the BusyFingers and Teacher applications. BusyFingers now has three window sizes (556x456 (original size), 700x540 & 800x600) which also have a cleaner and clearer look. There are two levels of vocabulary used in the lessons; Key Stage 1 & 2 and Key Stage 3 with the option to use just the vocabulary in Key Stage 1 & 2 or to include the Key Stage 3 vocabulary. The vocabulary used in the Key Stage 1 & 2 lessons are based around those words from the National Literacy Strategy. The lessons have been restructured with 8 progressive lessons teaching the QWERTY keyboard and a lesson teaching the number row. There is a new lesson dedicated to verb endings, with an extensive list of regular and irregular verbs. The sounds that are played when a user types the wrong key have been changed from a voice saying "No!" to a variety of beep sounds. The Teacher application now allows printing of the bar and line graphs. Printing is supported for the "All Users" option and for individual users. When the "All Users" option is selected, and more than 10 users have completed the same lesson, the bar graph for the users is presented in groups of 10 users. Also when a user has completed the same lesson a number of times, the text shown on the x-axis is now displayed more intelligently. A Preferences dialog shows each user their settings (i.e. window size, font size, whether audio is played, whether to ask if the text typed by the user should be saved and whether the Key Stage 3 vocabulary should be included in the lessons), and if allowed by the administrator, the user can change their settings. The number characters have been placed nearer to the fingers to use making it easier to identify which finger to use for each number. The BusyFingers application includes a new 'game' based on a jungle theme. Using the Teacher's application the administrator can control the users settings and lock them so that the user cannot change them. With the Teacher's application the administrator can chose whether the vocabulary being added or edited is included in the Key Stage 1 & 2 lessons or in the Key Stage 3 lessons. There is now a user guide describing the software and how to use it. To find out the secret of learning to touch type, click here. BusyFingers runs on both Macintosh and Windows operating systems. What do teachers and parents have to say about BusyFingers? The children are really enjoying BusyFingers. They use it every day and look forward each day to having their turn and practising their touch typing skills. I've even started to learn to touch type using it! Our 9 year old daughter prefers BusyFingers to the program they use at school. Every child should learn to touch type and it's our experience that BusyFingers really helps. Isabel will practice without any prompting from us. One of our special needs pupils started to use BusyFingers having tried two other software programs, and he says that it is much better than the others. 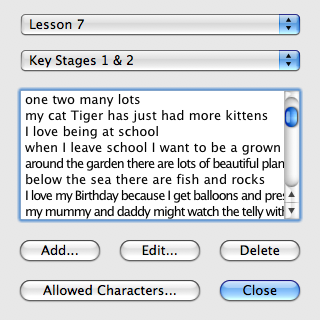 Having the MyKids keyboard has really helped too because he can reach the keys more easily. We've been using the BusyFingers software with our 7 year old son and even after only 6 weeks of practice he is considerably more confident when using the computer. BusyFingers has definitely helped!